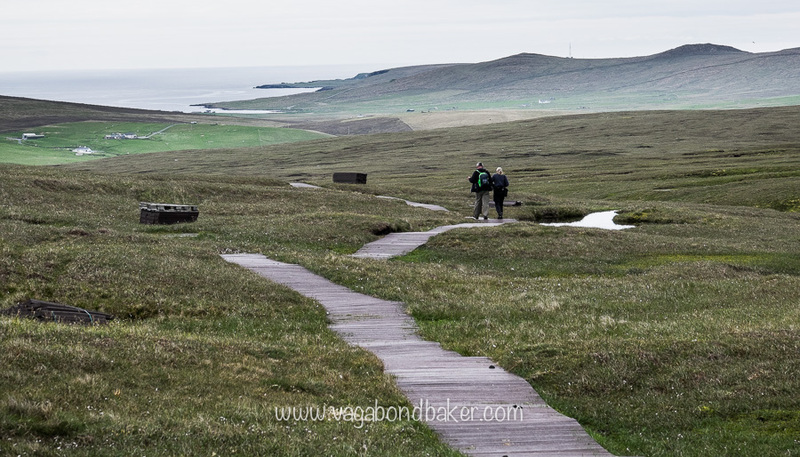 We were walking under a lead grey sky on a board walk snaking through boggy peat moorland towards the sea cliffs of Hermaness. Bonxies swooped and chased each other over the heather, one stood ominously next to the path ahead of us. The previous week we had been chased out of a field on the mainland by a pair of them, feistily protecting their ground nest site. 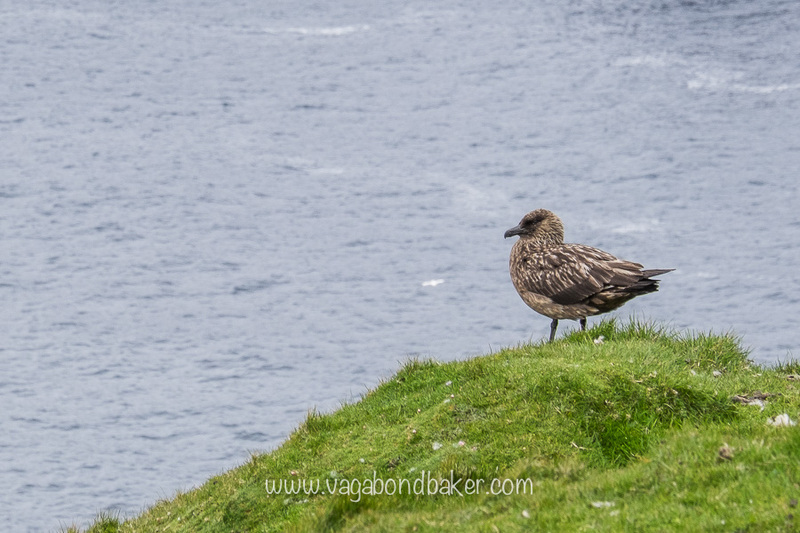 At the sight of this large brown bird – the Great Skua, Bonxie is its Scottish name and the name I’ve always known it as – my heart began to beat a little faster, yet as we approached it didn’t seem the least bit phased by us: it let us pass without even flinching! Hermaness is the world’s third largest Bonxie colony, there are around 700 pairs of them nesting on the moorland, and they are so used to walkers here that so long as you keep to the path they pretty much leave you alone. I say pretty much, one woman we met had one poop on her, in what she felt was a warning not an accident! Reaching the cliffs the north Atlantic ocean spread out in front of us; a cold wind gusted up over the cliff and Bonxies flying low from inland were suddenly thrust up by the updraft, giving them spectacular lift. I don’t know if birds can feel the rush, but these birds seemed to revel in the inclement weather. 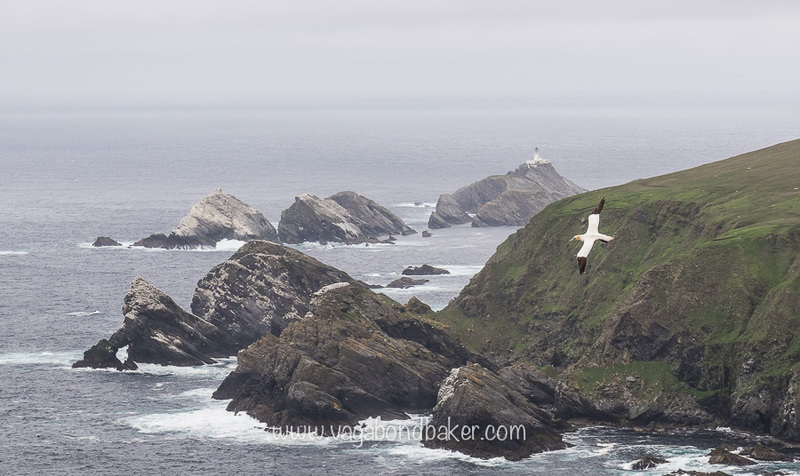 Muckle Flugga and a gannet. 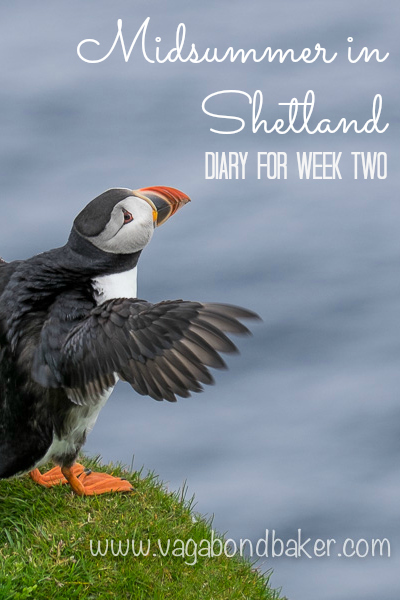 This rather unsummery cold weather stayed with us for all of our second week in Shetland, we have dipped our toes into week three today and it’s now pouring with rain. 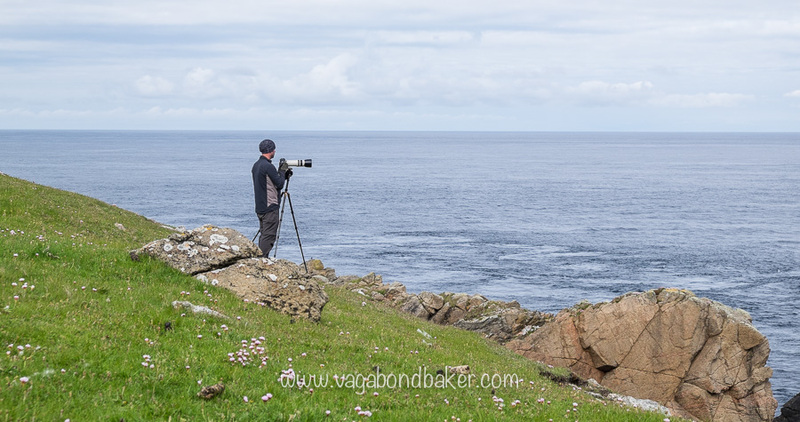 Ah well, we didn’t come to Shetland for a suntan, we came for its culture, scenery and nature, and boy did we see plenty of that in our second week! It was handy staying at the entrance to the half-hour walk out to the cliffs, somewhere warm and dry we could revive ourselves, pop the kettle on and change into dry clothes. 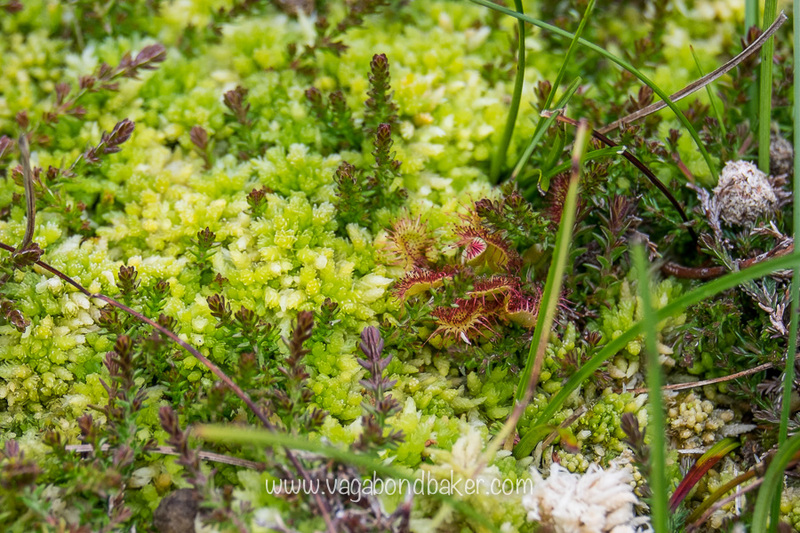 The walk out to the cliffs is full of detail if you stop for a moment to take it in, the boggy peat moorland is bursting with flowers including two carnivorous species: sundew and butterwort, their sticky leaves attracting tiny flies. Snipe, a small game-bird (such a horrid term “game-bird’, no birds should be a game) I’ve always considered quite secretive, circled playfully in the sky above us climbing with urgent wingbeats before straightening their wings and dropping with a prolonged thrum, a magical vibrating noise created by their outstretched wings. 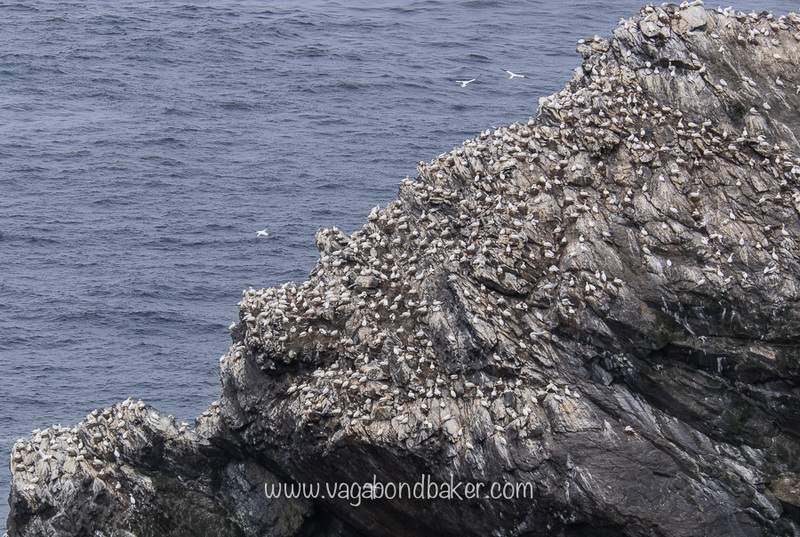 At the cliffs we met the sea birds: thousands of sleek gannets, gulls, puffins, fulmars, guillemots and razorbills. We followed the cliff-side path to the left, all of a sudden the smell overwhelmed us: gannets. Gannets, Britain’s largest seabird, build their geometrically spaced nests using their own guano mixed with seaweed. As you can probably imagine, the smell is very pungent, even on a wild, windy summer afternoon. Despite the smell, the spectacle is extraordinary. Thousands of these big white birds noisy perch on the vertical cliff face, their nests spaced just out of the pointy bill reach of their neighbour. 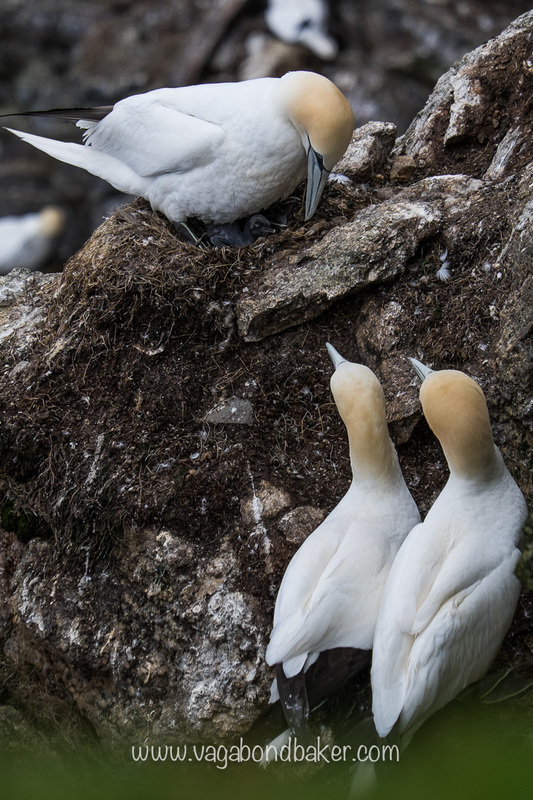 It is mesmerizing to watch the interaction between the birds and Hermaness is a great place to experience this as the birds are nesting on land rather than on an off-shore sea stack or rock. 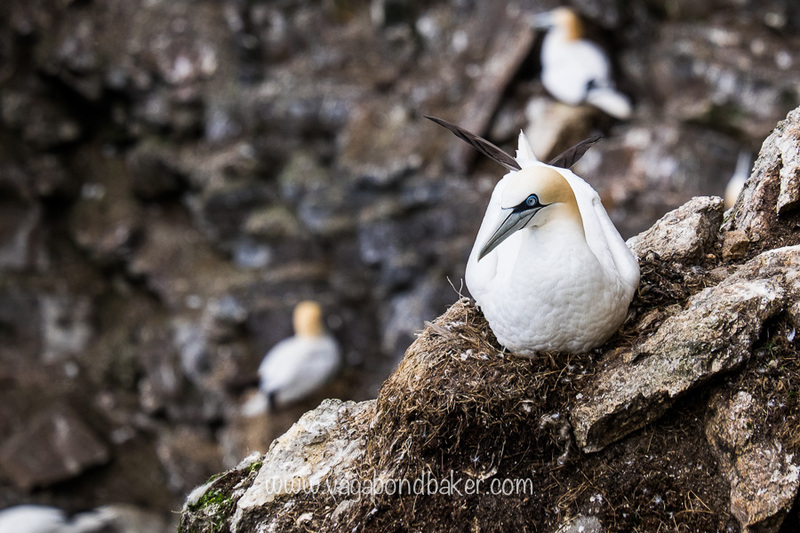 At one part of the cliff, near to where the path kind of peters out there is a drop in the cliff height and you can see some of the nests really close up, so much so that I could see baby gannets fidgeting under their parents. I’m a big fan of gannets, I loved seeing them fishing as a kid on the Welsh coasts on summer holidays. 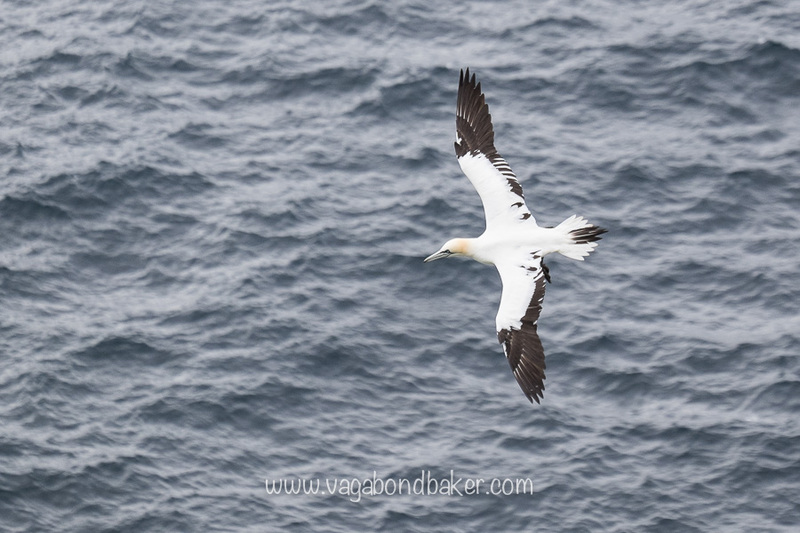 They are still a thrill to watch as an adult, we’ve watched them in many bays around Shetland, circling over the water, often from a height then suddenly plunging, like a dart, down into the sea with barely a splash, bobbing up moments later with a fish. 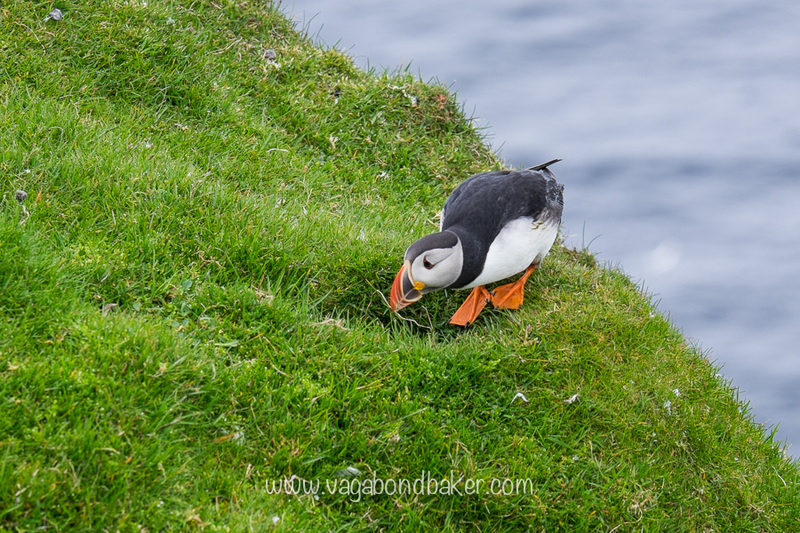 On a morning walk along the cliffs we encountered puffins busily tidying their burrow-hole nests, taking fresh grass down. Some appearing out of their holes to stretch their wings, to swap places with their partner. Such fun birds to watch, and they seem unbothered by humans sitting so close to them. 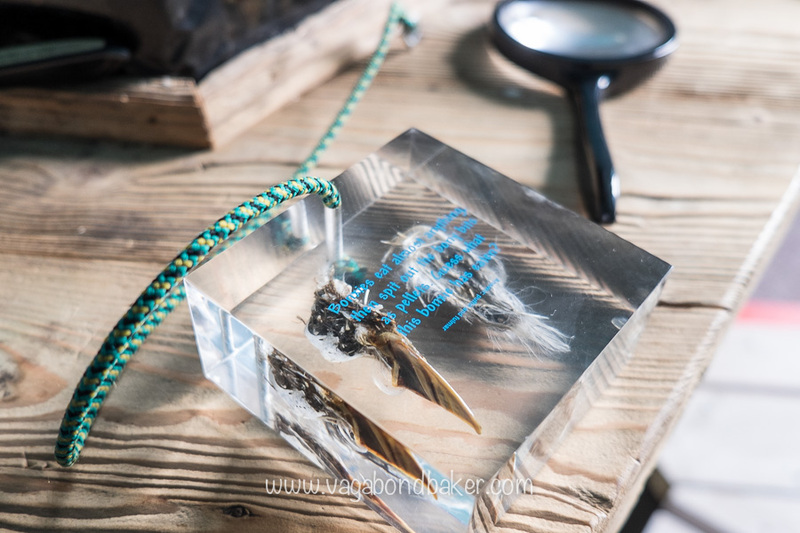 We learnt in the small but fascinating visitor centre that Bonxies often prey on puffins and other small auks, their distinctive bills are sometimes found in the Bonxie pellets (like owls and raptors, skuas spit up pellets of undigested food). 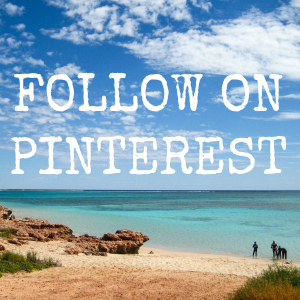 Now, you are going to love this! I’ve made a wee puffin animation! Bonxie pellets, one has a puffin bill. 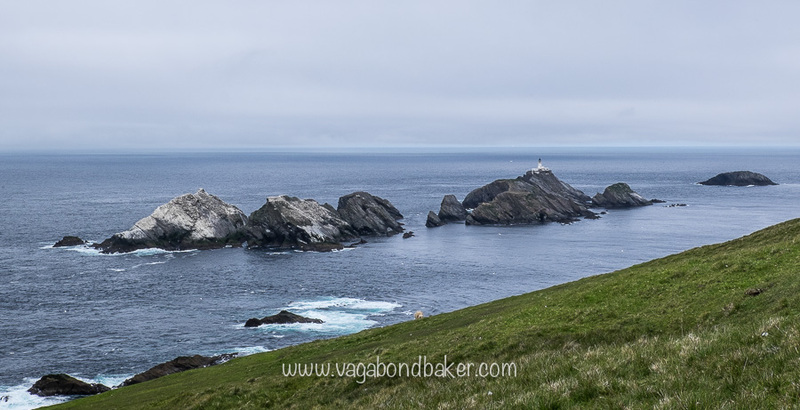 Heading along the cliffs to the right the steeply undulating path took us north where we found more gannets and took us closer to the lighthouse at the north of the island: Muckle Flugga. 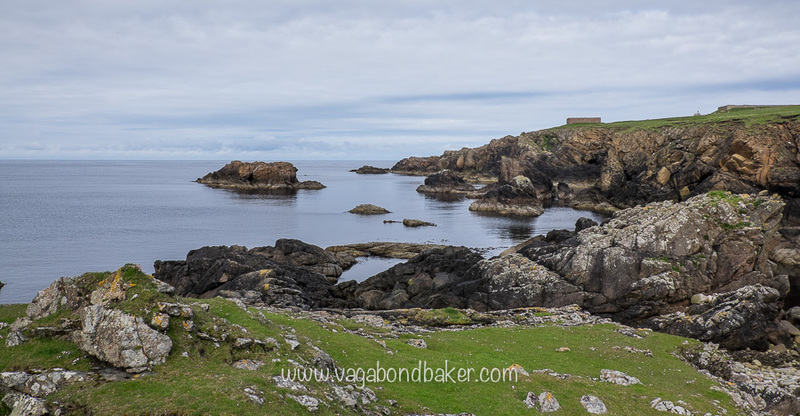 Muckle Flugga was Britain’s most northerly inhabited island until 1994 when the lighthouse keeper was replaced by a computer. What a wild isolated existence it must have been, a home on a craggy rock at the very top of the British Isles, only two rocks beyond it. 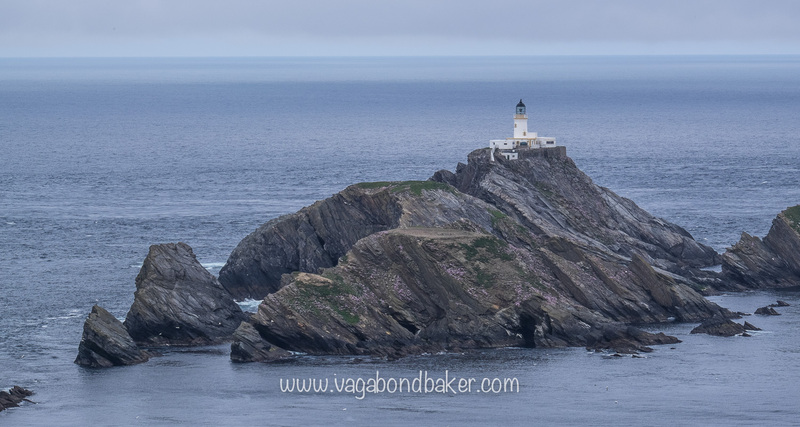 I was captivated by Muckle Flugga, I couldn’t take my eyes off it. Incidentally, the lighthouse was built by Robert Louis Stevenson’s father in the 1858 and the map of Treasure Island is apparently a dead-ringer for Unst! 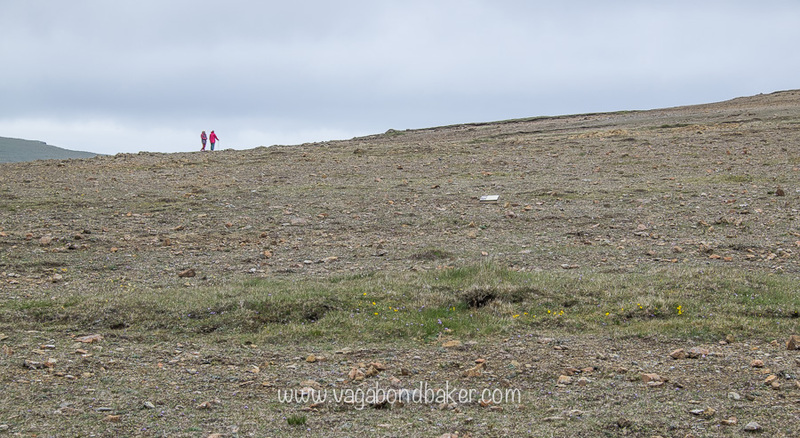 For a change from bird life, we visited the Keen of Hamar National Nature Reserve halfway down the island, just above Baltasound. This surreal rocky landscape looks like the last place you’d find nature but this is one very special environment. The rocks here are rare, rare to find on the earth’s surface anyway. Normally these ‘Serpentine rocks’ are formed deep below the ocean and only rarely are they seen on land. Violent movements in the earth 400 million years ago threw these subterranean rocks up to the surface and they’ve weathered over the millenia. 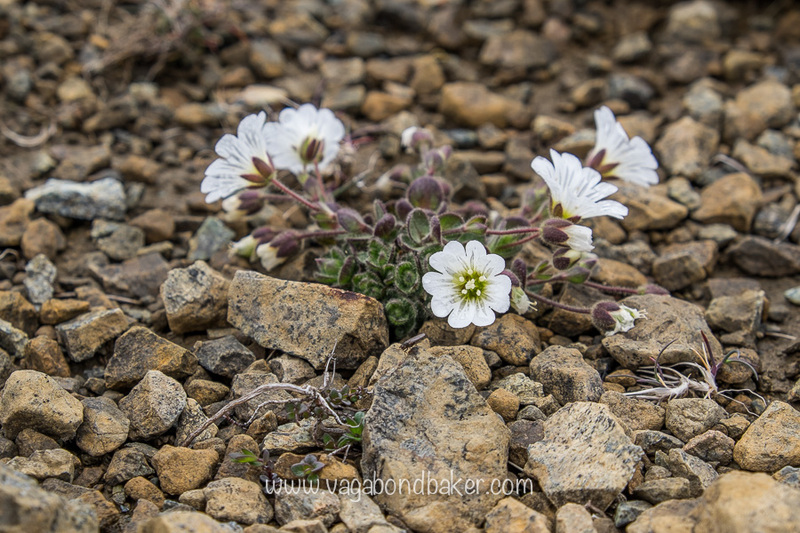 The soil here is very poor, and very old; only speciality plants can survive, like the extremely rare Edmondson’s Chickweed : this delicate white flower can only be found at the Keen of Hamar. 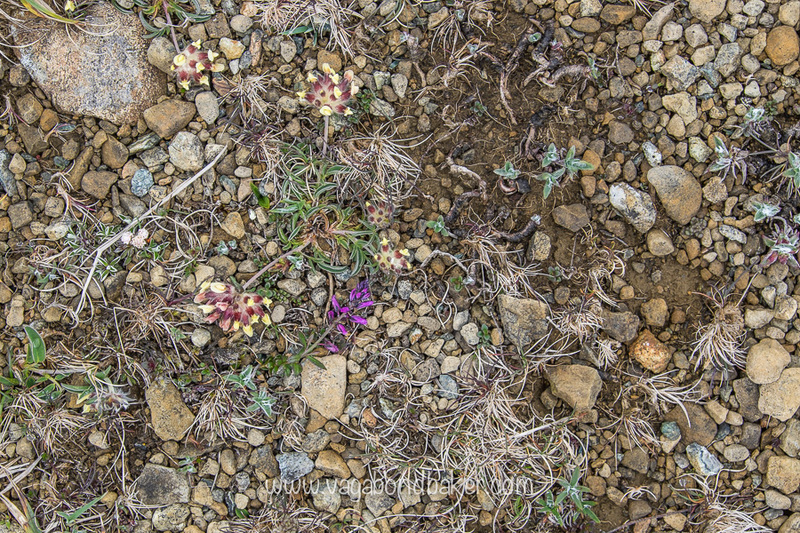 The barren expanse is actually bursting with colour if you crouch down and take a closer look. The flowers, including various orchids and grasses dot the dry gravelly ground like a tapestry: the more you look, the more you see. 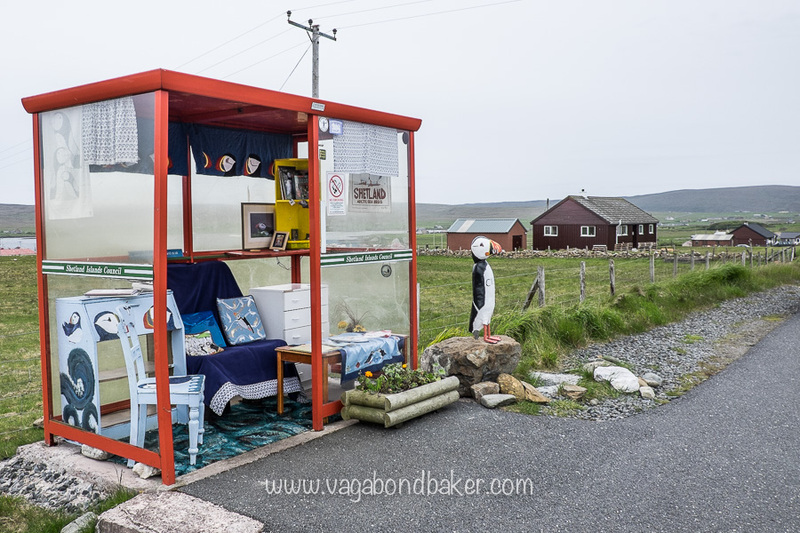 The Unst Bus Shelter, puffiness up. 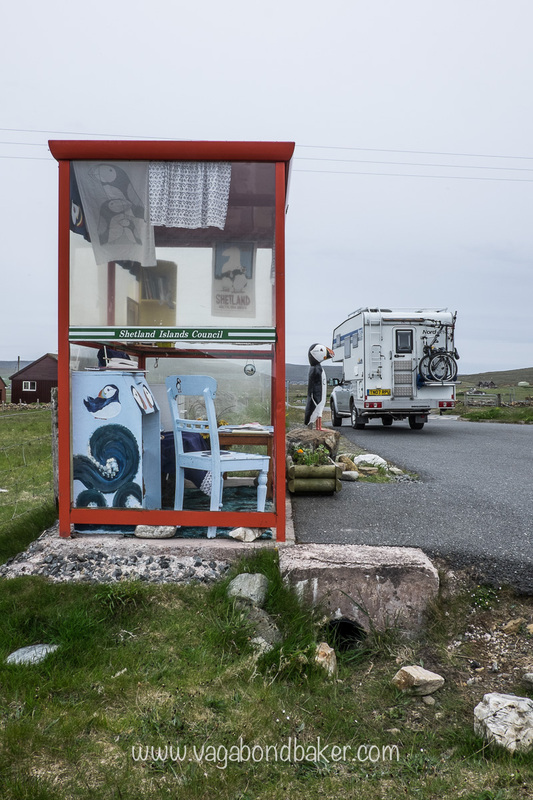 Just at the junction for the Keen of Hamar and the main road is the Unst Bus Shelter. 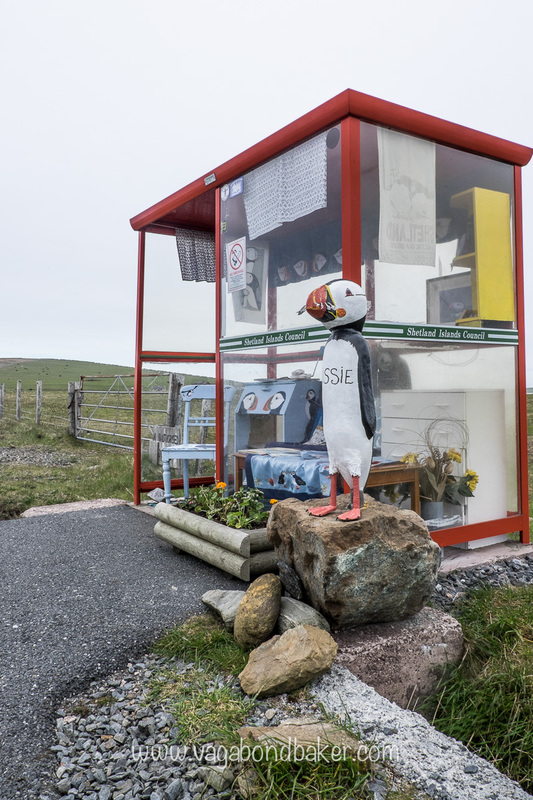 This themed, decorated bus stop is possibly the most famous bus shelter in the world (I’d first seen it on Pinterest). The theme for this summer is Puffins and this small red shelter is crammed with puffin bits and bobs including a hand painted chair and desk along with tea towels and cushions. If only all bus shelters were this plush! 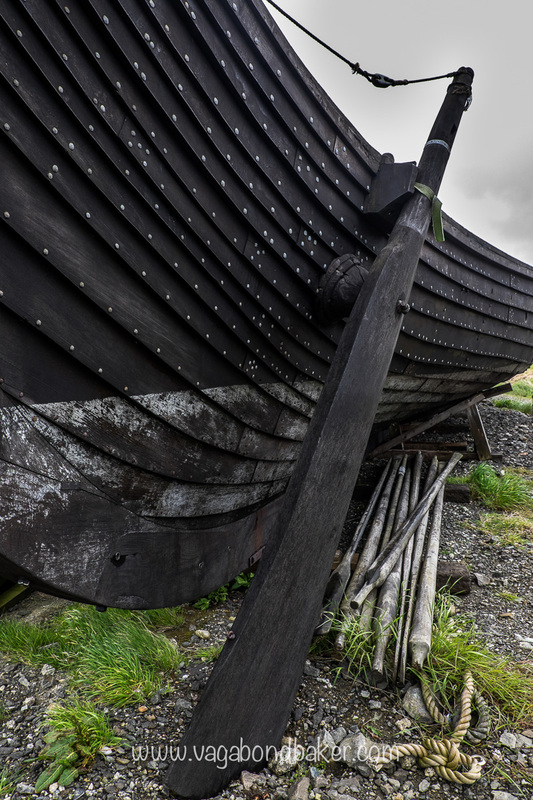 On the roadside heading north into Haroldswick there is a replica Norse Longhouse and ship. 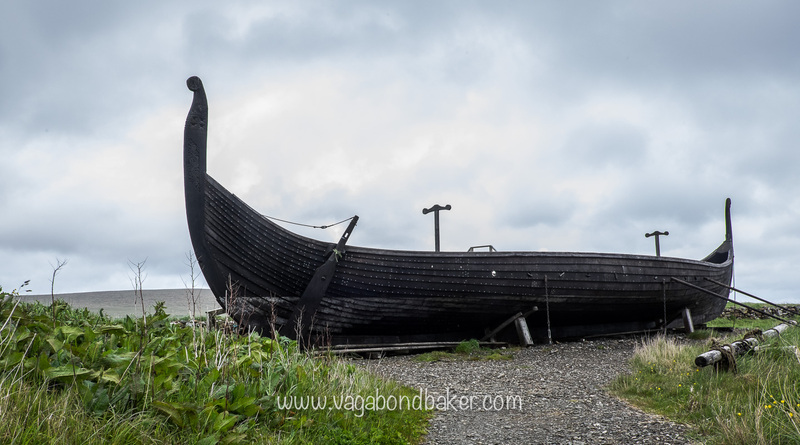 The dark wooden boat is a full-sized replica of the Gokstad ship found in Norway and it cuts a fine silhouette as you approach the bay. 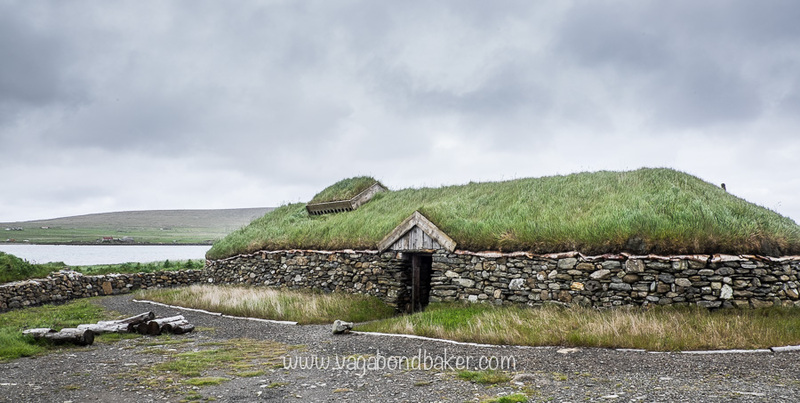 After visiting a couple of the Norse Longhouse ruins in southern Unst it was very interesting to step into the replica one. 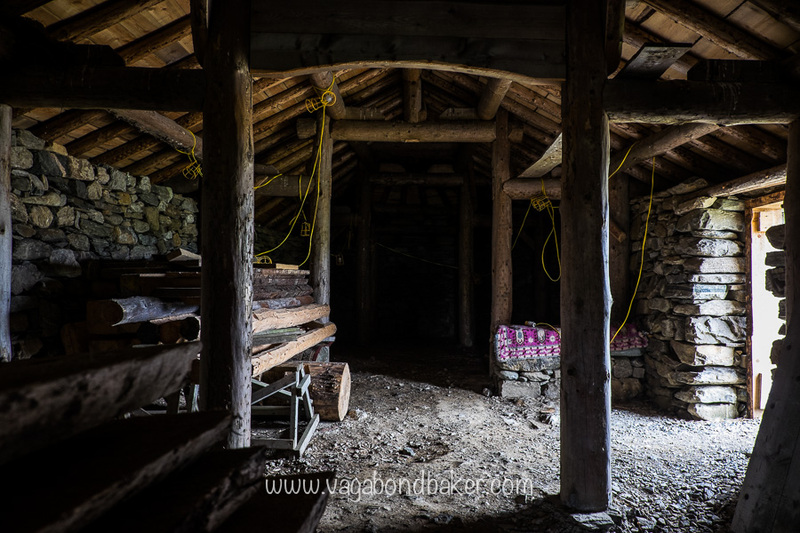 The most surprising aspect was how warm it was, there were no doors and no fire yet the open hall was noticeably warm compared to the windy day outside. 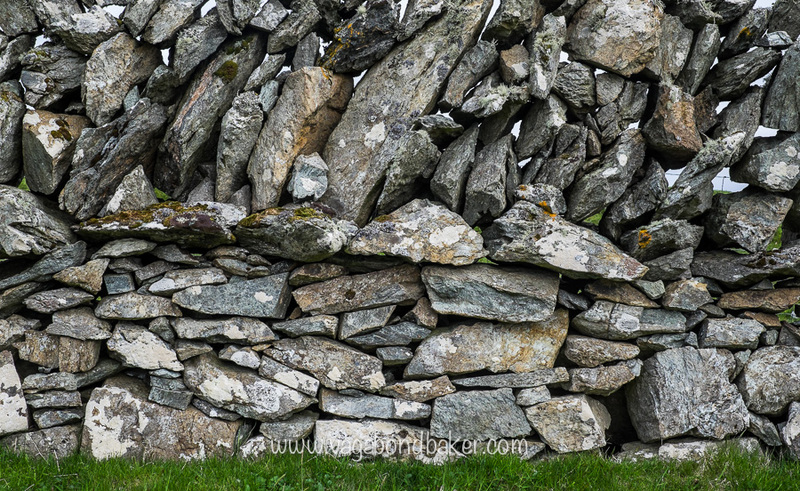 The thick stone walls and turf roof sure kept the weather out. 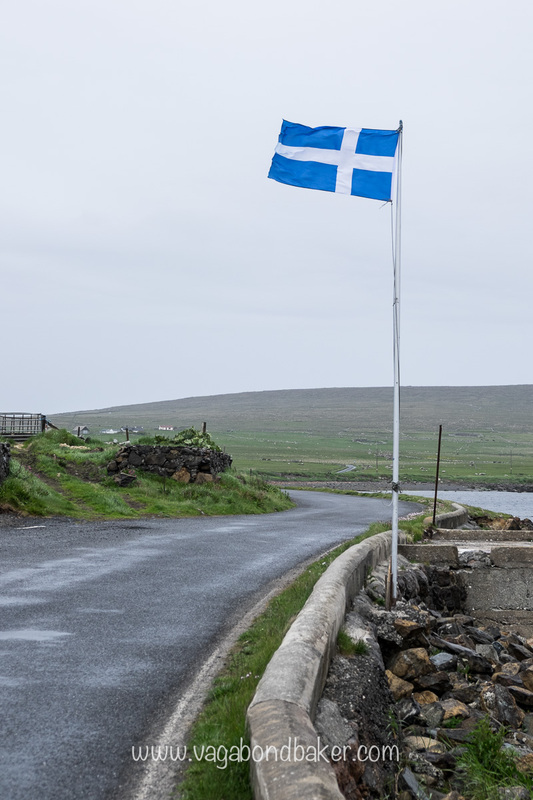 The Shetland flag is pretty much a negative of the Finnish Flag! Overall, we spent much of the second week up in the north of Unst, driving up to Skaw where Britain’s most northerly home is. We camped for a couple of nights at Norwick beach, just to the south of Skaw, where gannets and terns fished in the bay and a seal often watched us from the shallows. For Midsummer we ended up camped on the old RAF base at Skaw, it was a strategically important radar station in the Second World War, all that’s left now are some ruined buildings. 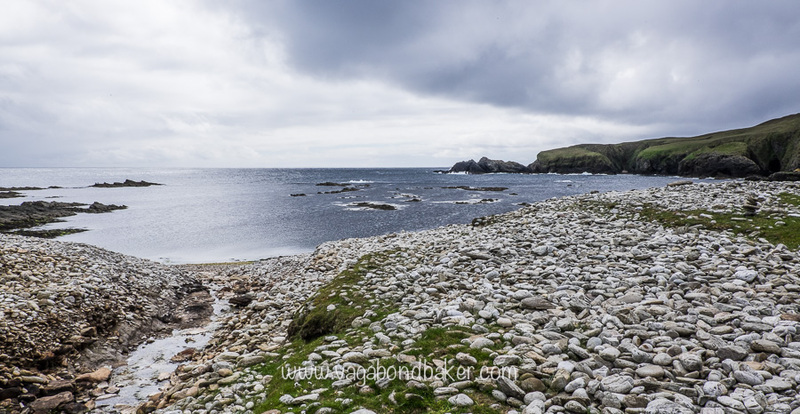 A bumpy track leads from the ‘main’ road to the base and the Lambaness headland, now a popular spot for birdwatchers as the fish-rich waters attract seabirds. A sign giving information about the site advised that the road wasn’t suitable for cars but we saw a few, and of course it was nae bother for our 4wd truck. 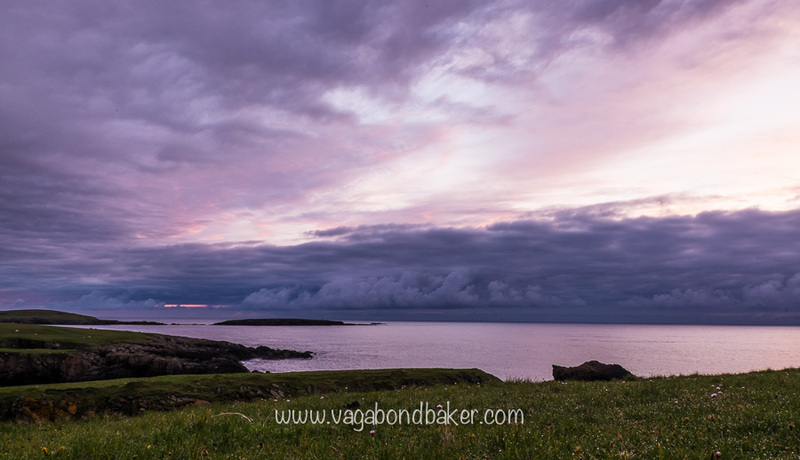 It was the perfect place to see the midsummer sunrise, it was the most northerly place we could camp in the truck and was the most eastern point on the island. The alarm buzzed at 3.15am, I groggily opened the blind above the bed, half of me hoping that it was raining, that the sunrise would be a washout. I was warm and comfortable, I did not want to get up! The window revealed the sky to be already quite light, a thick band of cloud hovered over the horizon and feathered out, those feathers tinged with pale lilac. I crawled from the warmth of my bed and, wrapped in my fleece blanket, I sat at the window and watched as the colour became richer. 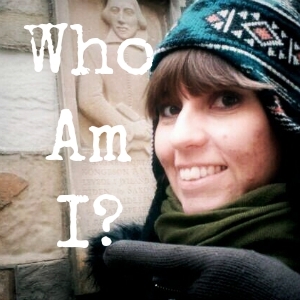 I snapped a few photos then quickly threw on some clothes and my coat and ventured out into the dawn. Heading down to the headland a short way to get a pretty foreground I waited for a few minutes until 3.28 stuck, the offical sunrise time (for Lerwick). The sun never actually showed its face but the mackerel clouds became even more vibrant as I walked back to the truck. I snuck back into bed, Chris stayed out much longer, photographing the early morning wildlife. The rest of the day was wet, the day never quite lived up to the beautiful sunrise but it was a Midsummer – or Simmer Dim, as they say up here – I will cherish forever. 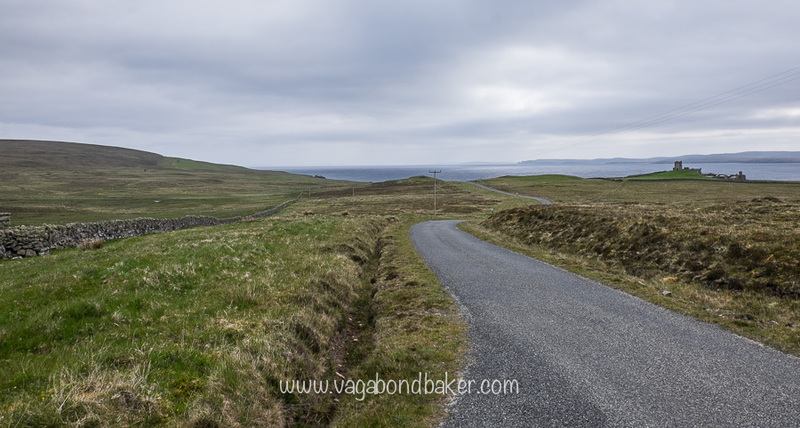 We left Unst the following day, taking the ferry to Fetlar, a smaller island to the south. Most people visit Fetlar for one single reason: to see the tiny wading bird, the Red-Necked Phalarope. This pretty little bird breeds in the mires in the east of the island and there is an RSPB hide overlooking some of the mire pools. The roomy car park overlooking Loch Funzie (pronounced Finnie) was our campsite for the rest of the week. 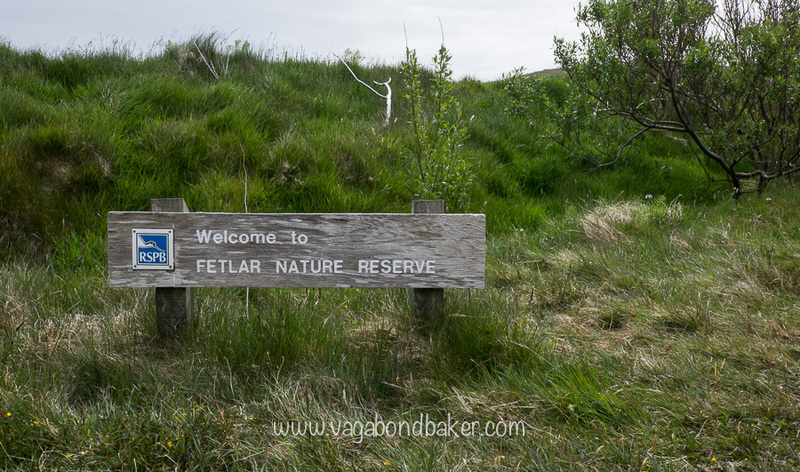 The campsite on Fetlar has closed so we had no option but to wild camp. Red-necked Phalarope, a tiny bird, this is a female. 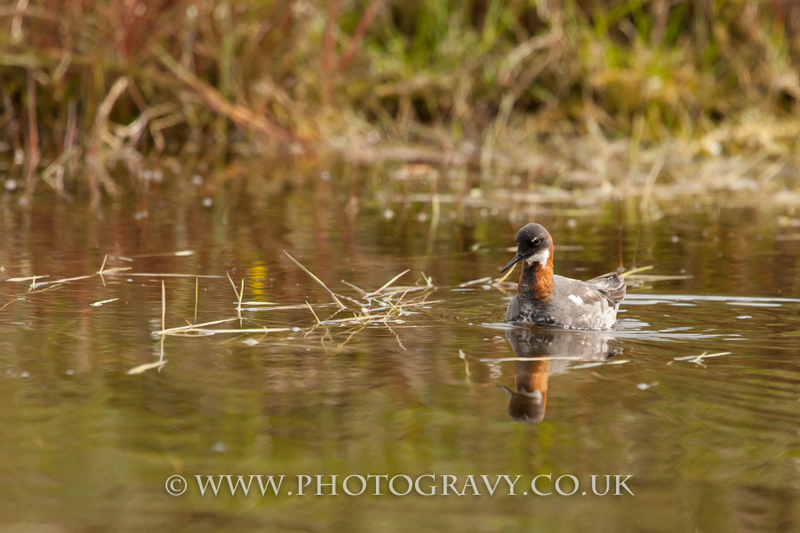 We had actually seen a Red-necked Phalarope on our first night on Unst, it was swimming in the small pool near to where we camped, so the pressure was off for us to see one. In fact, one landed just a few metres from the van on our first night camped on the car park too! 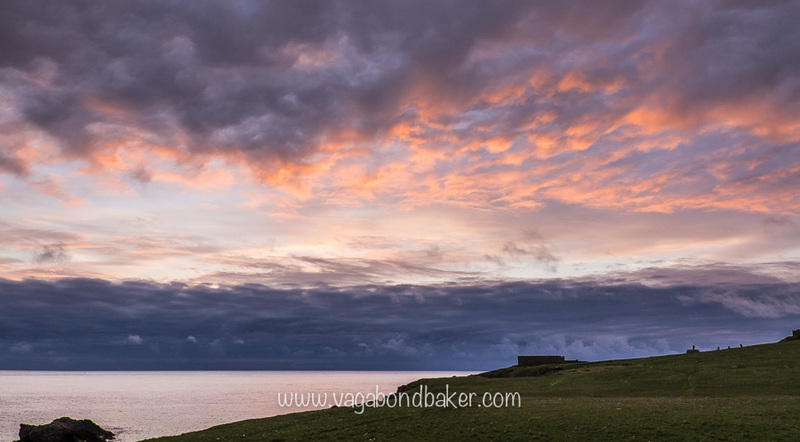 I spent most of the time in the camper while Chris went off photographing wildlife or hiking one of the headlands. I had a fun afternoon ‘baking’ the pan scones and getting back into learning Finnish while minibuses of birdwatchers appeared and disappeared. While it was great to see the phalaropes (amazing little birds, the males bring up the chicks – it’s the female that deserts them – and they migrate all the way to Central America after the summer), the bird highlight of our few days on Fetlar was to see fourteen Red Throated Divers on the loch very early one morning. Chris had set his alarm for 4am – a good time for wildlife photography apparently – and had headed out into the dawn. Curiosity had me peering through my ‘bedroom’ window, and I counted fourteen of these rare diving birds on the water, at one point they took to the air and circled the loch, it was an extraordinary sight. A bird that is rare to find on the Scottish mainland, and usually found as a single bird in many of Shetland’s bays and lochs was here in seeming abundance! Unforgettable! 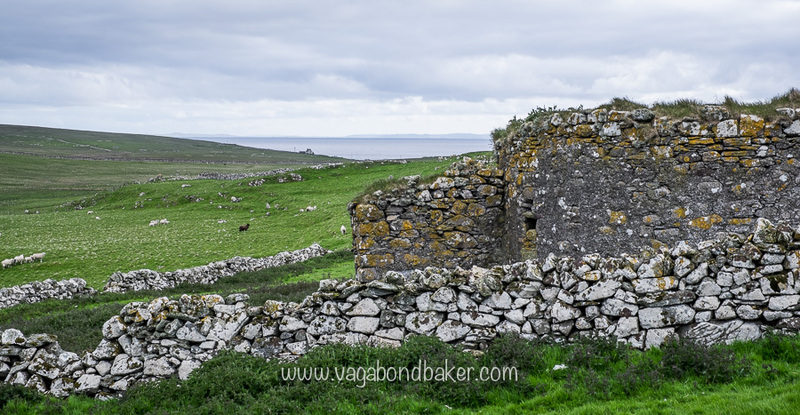 We did a walk in the north-east of the island, a loop to the Round House at Gruting. 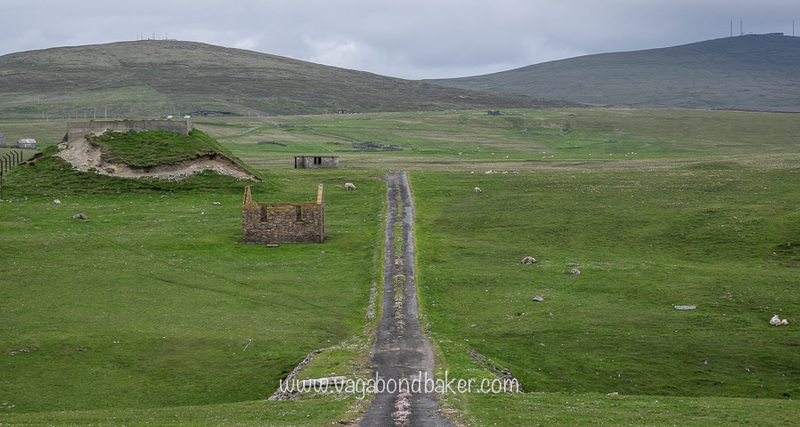 Fetlar’s population dropped, as many Highland communities did in the 1800’s, with the Clearances. The island Laird – a Sir Arthur Nicolson – cleared the land for sheep, evicting many crofting families in a shameful slice of British history. 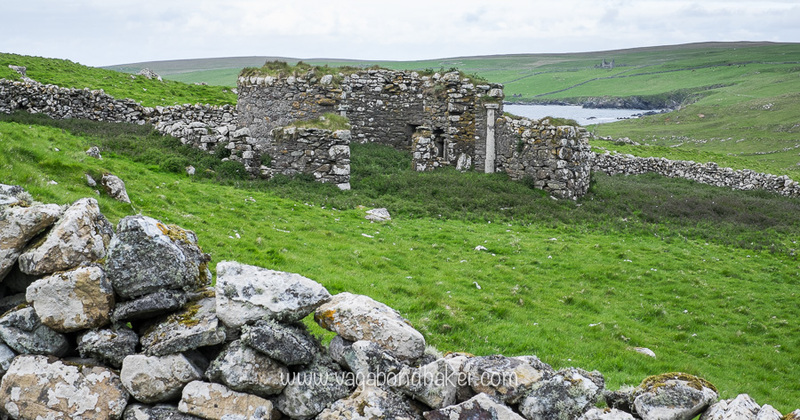 He lived in a grand, eclectically-designed house on the west coast of Fetlar: Brough Lodge, now a ruin undergoing renovations. He also built a folly in the moorland to the west, the spooky Round House at Gruting (he was obsessed with curved buildings apparently). It is said that the house was probably built using stones from the evicted crofts and that their lost souls haunted the building. Sir Arthur heard strange noises on his first night in the Gruting house and never stayed there again! It now stands in as much ruin as the fallen crofts, an unfriendly carpet of nettles fills the crumbling interior. In Fetlar’s Interpretive Centre (£3) we learnt more about the Nicolson family, the super-helpful volunteer Francis showed us home video footage of the family – descendants of the evicting Sir Arthur – at Brough Lodge from the 1930’s, it was fascinating and revealing to watch. 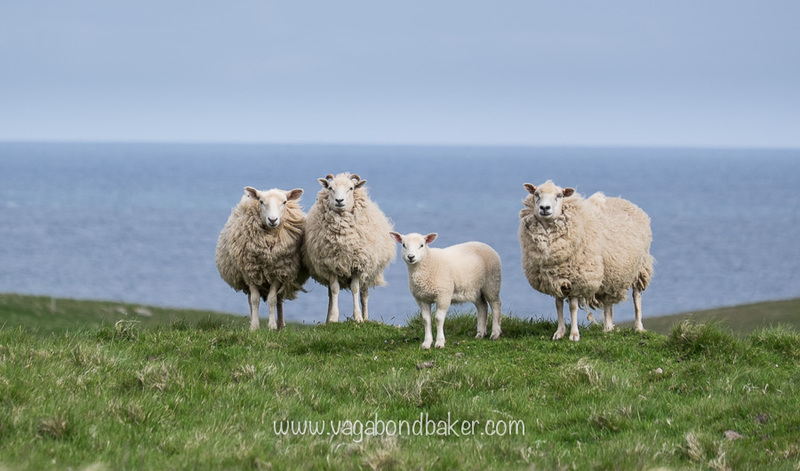 The friendly neighbours, aren’t they woolly! 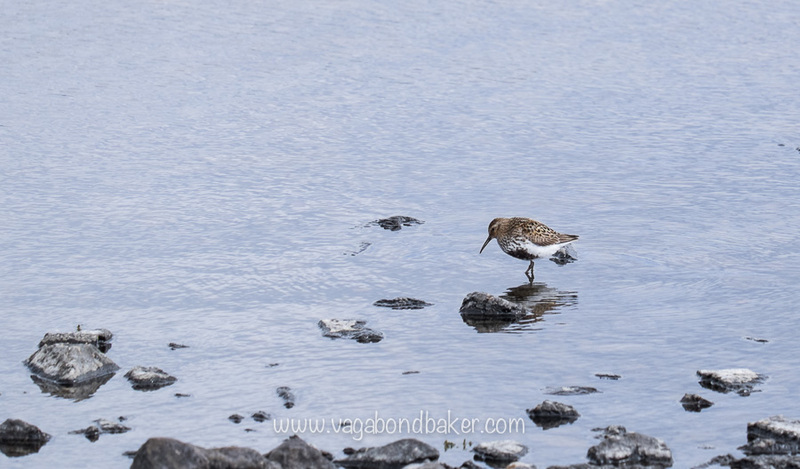 A perky Dunlin! They flitted past our van so often, so tiny, so cute! 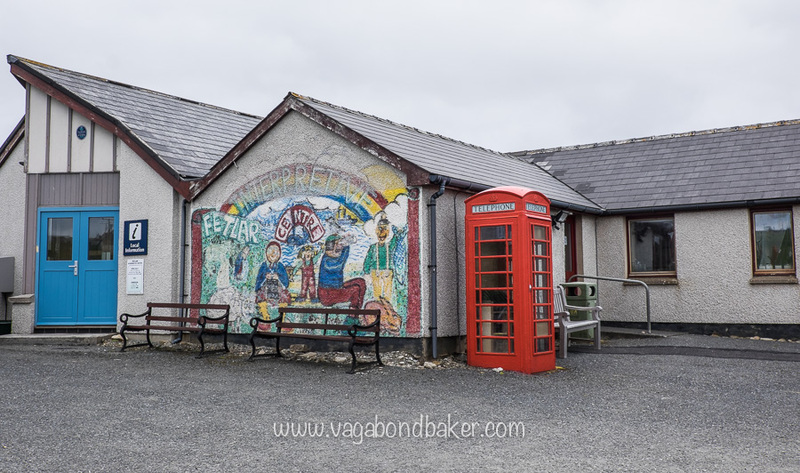 So that was our second week in Shetland, less cake that the first – not for want of trying, very time we passed the cute-looking vintage tea room in Haroldswick it was closed (our fault, not theirs! 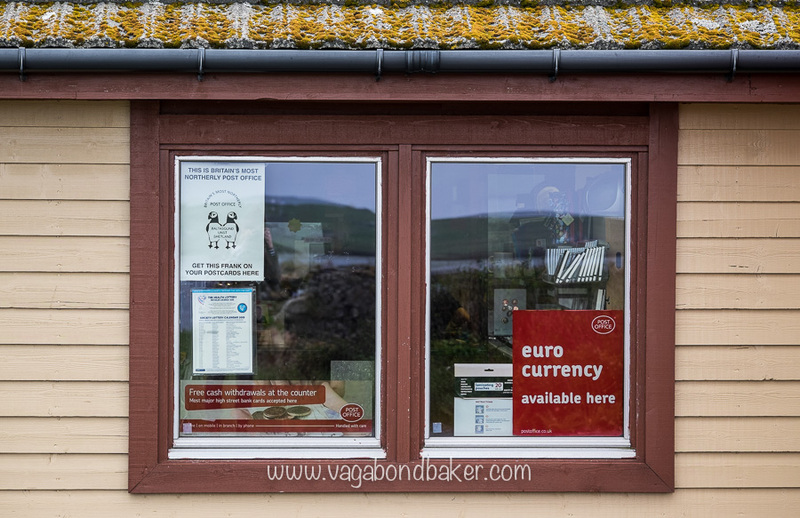 ), and our timing was equally bad when it came to the famed Bus Cafe at the Belmont Ferry Terminal, it doesn’t open on a Monday, the day we left Unst, I was gutted! The week surpassed the previous on wildlife though, and we even saw an otter while camped on Lambaness. 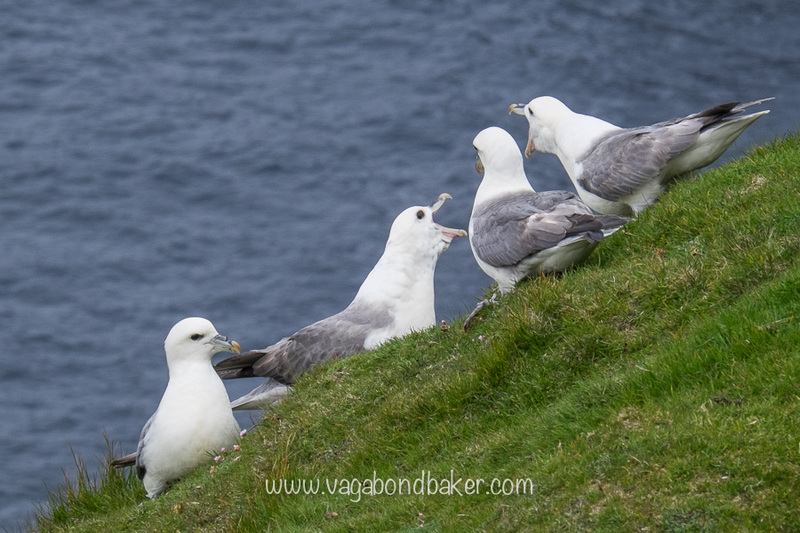 British wildlife doesn’t get much better than Shetland! 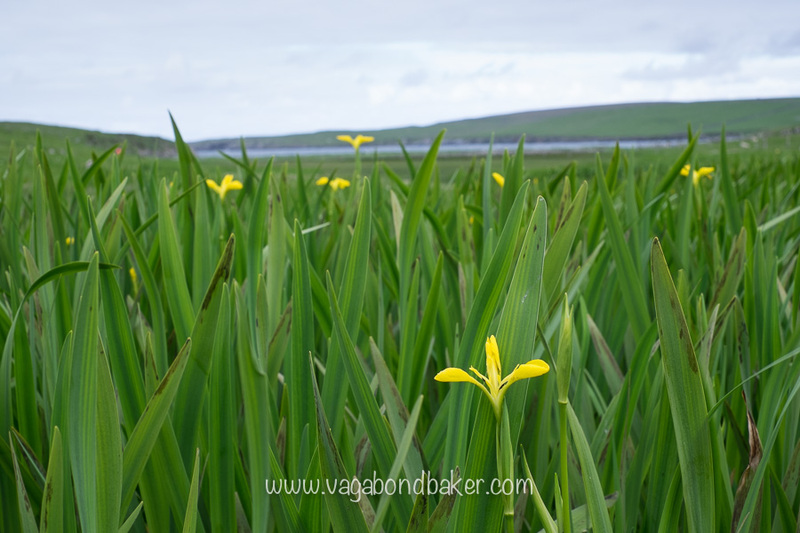 Midsummer in Shetland, diary for week one. I hope you’ve enjoyed this week’s diary, let me know your favourite bit or your favourite photo, I love hearing from you! 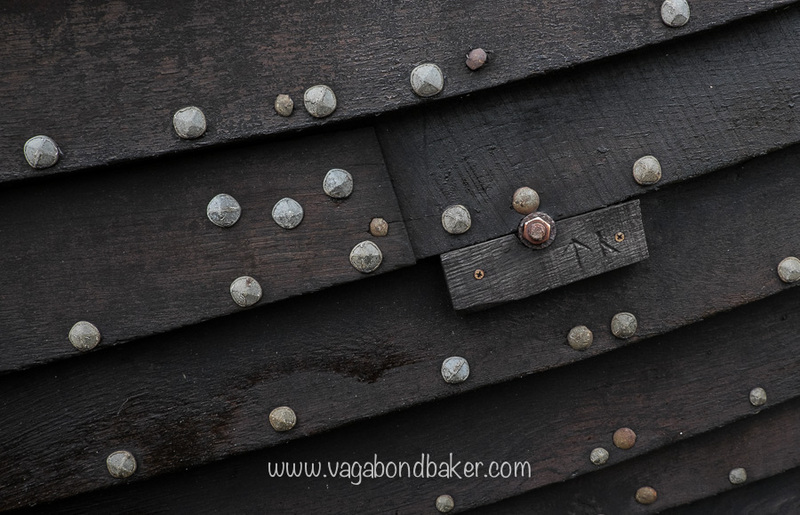 The Scottish Isles are somewhere I’ve been wanting to explore for a while and there’re so many reasons why in your post. You’ve captured it beautifully – I adore those puffins – both in words and pictures. Some of the landscapes reminded me of Iceland where we were last week. I love a good sunset but being up for the dawn with nobody else around is always more special. Hi Suzanne, thank you! Funnily enough when I read your Iceland post I thought the same about the landscape in reverse! Yes, sunset with no one is blissful, and so are sunrises compared to the clammer of sunrisers at places like Angkor Wat! 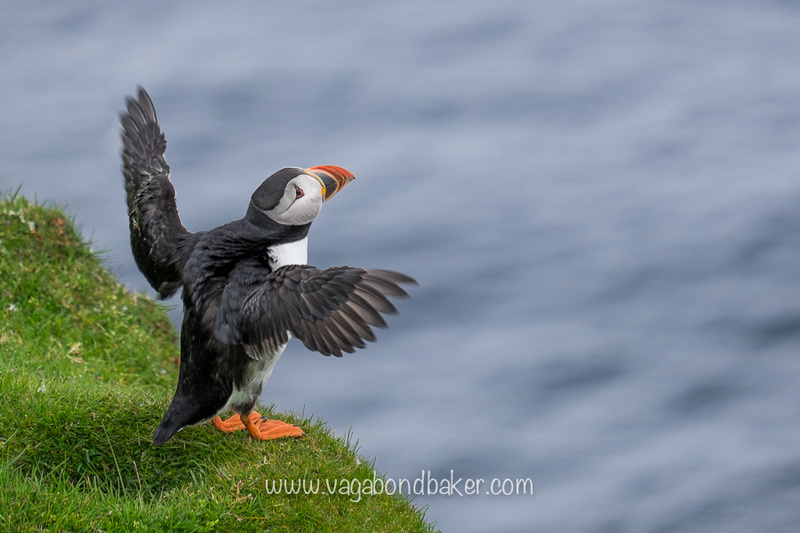 Puffins are just the cutest, if you ever go Scottish Isle exploring I’d highly recommend mid June to end July to catch the puffins, they don’t hang round for long! The photo of those Puffins are AMAZING! 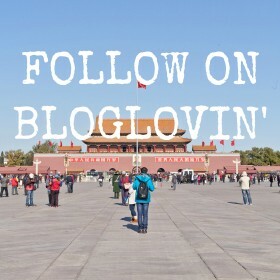 Also, love your blog (just found it!) food and travel – best combination ever. Thank you Elle-Rose! I cannot separate food and travel either! Puffins are beyond doubt the most photogenic, cute birds ever, and so accommodating, it’s almost impossible to take a bad photo of them! What a fabulous adventure you’ve had. It looks as though you’ve really captured the wonderful nature feel of the Shetlands. I love all the pictures, varying skylines (well it is Scotland after all) and the great gifs. As for that lady who was pooped upon, didn’t she know that some people (rather bizarrely) say that it is good luck to be pooped upon by a bird? – I’ve no idea why. Thank you so much! I love making the gifs, I’m trying to branch out into time-lapse and converting to video too now, my new camera makes it so much easier! Everyone she met told the pooped on lady she was lucky! I guess it comes from ‘what where the chances’! It’s been a super adventure, we have just a few days left here. 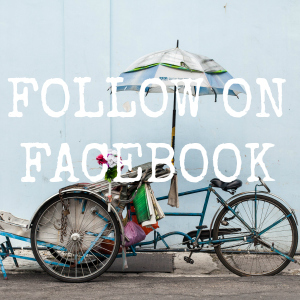 Thanks for commenting! 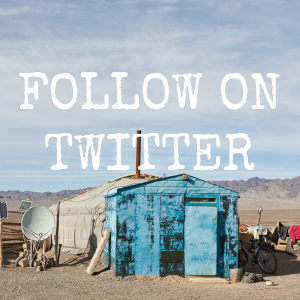 Shetland is bursting with quirky treasures! So wonderful to find, you’d absolutely love it up here! That puffin animation totally make me squeak with the cuteness – I’m going to have to go just to see them! Sounds like a fantastic trip so far and it’s so interesting to read as I knew nothing about the islands and there’s such a diversity in things to see. Thank you so much Katya! I loved making the little animation, they are so cute!